Generally, the words “dynamic” and “print” don’t go together, but hear me out. When it comes to marketing, companies will employ all sorts of methods to track data and effectiveness. One common way is to swap out different phone numbers on advertisements, to measure how many calls a particular ad generates. 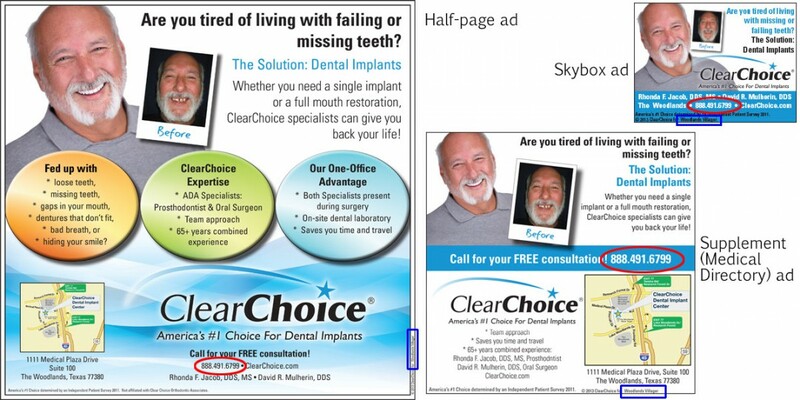 As the Senior Graphic Designer (and Acting Creative Director) for ClearChoice Management Services (which created all marketing for the scores of ClearChoice Dental Implant Centers across the United States, it was my job to not only create ads, but also ensure that an ad could be used in multiple markets and multiple publications. This meant that the phone numbers, doctors, addresses, and publications likely would need to change. As I learned from the outsourced graphic designers who had been tasked with the job prior to my start, the process of swapping out phone numbers wasn’t hard, but it certainly was time consuming—especially when a single ad must be recreated dozens of times. Even worse, if a typo was discovered after the design had been approved, and the custom phone numbers had been inserted, uh oh! There was no way to fix the typo once. It had to be fixed in every single file. This process was extremely inefficient (but lucrative for the outsourced graphic designers). Using Adobe InDesign, I created several ads of varying sizes (including a billboard). For one particular newspaper campaign, we wanted to know which newspaper would yield the most calls, and so each newspaper was issued a different toll-free number. As the campaign would include a skybox ad (the ad space in the top right corner of the newspaper’s front page), a halfpage ad, and supplement ad (to go in a medical directory insert), it was important that each newspaper used a single toll-free number consistently. Once the general designs were approved, I built a simple spreadsheet to assist me in creating the multiple versions of each ad. Of course the phone number (highlighted above with a red oval) had to be different. In addition, I also inserted the name of each newspaper (highlighted above with a blue rectangle) as a simple quality assurance measure. This ensured that the phone numbers would match up, but it also ensured that the ad manager at the newspaper would be sure to place the correct ad in the correct newspaper, as that was so important for our data collection. Using Data Merge, I created several ads from a single file, saving significant time. Further, I used a special plug-in so that I could export the PDFs individually with custom file names from the data merge fields. 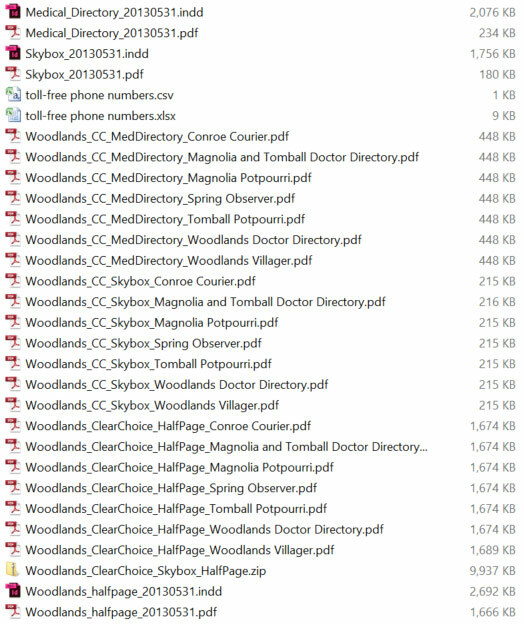 (By default, InDesign exports data merge files into the unhelpfully named filename-1.pdf, filename-2.pdf, and so on.) This meant that when it was time to send the files to the newspaper, each newspaper was labeled within the file name, to minimize any chance of misplaced ads (as it was one company who managed all seven newspapers). Inevitably, there was a change to the ads at the last minute, and instead of needing an extra day to recreate the 21 files (7 newspapers × 3 ads), I made the change, and re-exported the files in a matter of minutes. Not only was this process extremely efficient with regard to time, storage space (one source file rather than several), quality and version control, it helped to eliminate a very mundane task. In my experience, it is during the mundane tasks that people are most likely to make a careless mistake. All in all, I believe I succeeded in my efforts to built a better mousetrap.